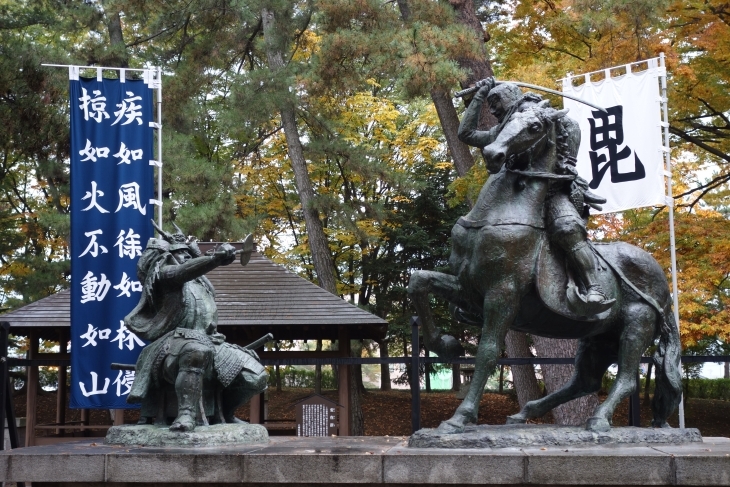 Once the location of the headquarters of the army of Shingen Takeda during the Battle of Kawanakajima, Hachimanpara today is opened to the public as a historic park filled with greenery. 12,000 ㎡ of artificially made hills covered with grass, the murmur of the brook with arranged natural rocks, and an arbor with a classical thatched roof are some of the qualities that bring relaxation to the locals. Adjoining to the City Museum, the old battlefield of Kawanakajima and Hachimansha, it is the best spot to enjoy the historic walk. Approx. 2 km from Nagano IC, or approx. 20 min. on the bus to Matsushiro from JR Nagano station, get off at "Kawanakajima Kosenjo", walk for 2 min. * "マップコード" and "MAPCODE" are registered trademarks of DENSO. It was added to My Plan. Do you see My Plan? Copyright (C) Nagano Convention & Visitors Bureau All Rights Reserved.